So far, so good. If I wasn't an idiot, I'd be better at this than I am. But I can't complain about the start. On the field, the NFL's remaining unbeatens are New England, Indianapolis, Pittsburgh, Dallas, and Green Bay. One real surprise among the five, but the real surprises in the league are the teams that don't appear to be that good. Kansas City, San Diego, the Giants and Jets, Philadelphia, and Chicago were all playoff teams a year ago. All are 1-2 and in various states of disrepair. The New Orleans Saints, darlings of the NFL just a year ago, are 0-3. Suddenly, Sean Payton looks like the guy Jim Fassell once stripped of play-calling duties in New York. Cincinnati, a chic pick to make the playoffs this year, is 1-2 and looks horrible defensively. That'll be eight teams that probably shouldn't be as bad as they are. For some of them, it doesn't get any easier in Week Four. Green Bay at Minnesota: Ask anyone who knows me, and they'll tell you that I have that "fan" thing in me. I can talk smack when it's warranted, and sometimes I'll even allow myself to say things I know aren't true. I've done that this week, even going so far as to make a Coldstone ice cream bet with some on-air colleagues. On the surface, this seems like a Captain Obvious deal. The Packers will win. Dig a little deeper, however, and you'll see some potential landmines under the Metrodome roof. The Packers are struggling with the deep passing game. In reality, they've only hit one real deep pass in three games, that being the bomb to James Jones in the Giants game. Outside of that, Green Bay has been pretty mediocre in this area. The Vikings' defense is similar to the Chargers in a couple areas. They stop the run very well, they don't defend the pass nearly as well, their linebackers can be exploited in space, and they're not deep at cornerback. However, the Vikings have a couple significant edges in this offense-defense matchup. The safeties, Darren Sharper and (probably) Dwight Smith are much more active than San Diego's tandem. They'll cause problems for the passing game if they can't develop some sort of downfield threat in the game. On the bright side, Sharper and Smith playing farther away from the line of scrimmage might open up the running game for a few shots. The Packers might have some success with a few quick-hit run plays if they spread out the Vikings' defense. That would either take linebackers off the field or force them to look pass first on a particular play. The Packers have struggled to stop the run. Luckily enough for Green Bay, it appears that Chester Taylor will play Sunday. This is good because Vikings head coach Brad Childress is probably dumb enough to keep Taylor on the field instead of Adrian Peterson. Other advantages for the Packers: They've played quite well at the Metrodome recently, Favre is really on his game so far, the secondary looks unlikely to surrender a ton of points to this Vikings' offense, and I think Green Bay has an edge in overall talent. The Vikings will be pumped for this game, but the Packers will slog their way to a 4-0 start. Denver at Indianapolis: The Broncos are out to show they're not as bad on offense as Jacksonville made them look last week. The Colts do have some holes on defense, but I think Peyton Manning and the offense are too much for Denver to slow down. I'll take the home team. You'll have to excuse the mess. I don't have time to explain my thinking on these picks, so it's going to be rapid fire this week. Get excited. We get Erin Andrews (and whoever else ESPN sends) on the blue turf in HD tonight. Of course, this would all be better if Erin Andrews had eaten anything over the summer. NFL picks either late tomorrow afternoon/evening or early Saturday. Please stay tuned. And don't forget those hockey games from London this weekend. I don't want to be the only one watching hoping to see Chris Pronger get destroyed by the great Anze Kopitar. On to the picks, where things weren't so hot last week. I blame Anthony Morelli, Houston Nutt's defense, and Alabama. The whole state. Mindless Speculation will be a series that appears, well, when there's something to mindlessly speculate about. It will be what the name suggests. Nothing more. In most cases, it'll just be my guess as to how a story will play out, or if it will play out at all. When I can cite information, I will, only because it helps make me look like less of an idiot. It's never a good thing to hear about the loss of a college sports program. Athletes need to make a decision: Find a new place to play my sport of choice, or quit playing that sport to stay where I am. Coaches lose jobs. Fans lose a team they have followed with dedication and passion. In men's Division I hockey, it's really tough to lose a program. There are, after all, only 59 of them to start the 2007-2008 season. After this season, you can make it 58. Wayne State (Mich.) has decided to do away with men's hockey after this season. The Warriors made the NCAA Tournament once, back in 2003, but never were able to build on that appearance. There was talk of building an on-campus rink, but it never happened. Instead, the Warriors played most of their games at the Michigan State Fairgrounds Coliseum, far from their campus. They never drew well, struggled to develop a loyal fanbase, and lost money as a result. They tried to apply to the CCHA, in hopes of stabilizing the program, but they were denied. The feeling was that Wayne's future depended on getting into the CCHA. Wayne State belongs to College Hockey America, a five-team league that has struggled since their inception. Originally six teams, CHA lost Findlay (Ohio) when they dropped the sport, and they lost Air Force to Atlantic Hockey. They were only able to add Robert Morris (Pennsylvania) to the fold in this time. The league gets an automatic berth to the NCAA Tournament every year, but no team has ever won a game since the autobid was installed (Niagara had won as an at-large). Bemidji State, Wayne State, and Alabama-Huntsville have all put scares into higher-seeded opponents, but none were successful in winning a game. When Air Force left, the NCAA gave an exemption to the CHA, allowing them to maintain their automatic bid, even though they didn't have the normal minimum of six teams needed for an autobid. Now that Wayne State is leaving, the future of College Hockey America is in serious doubt. Can the NCAA continue to exempt a four-team league with programs that are largely struggling on the national scene? My guess is that the NCAA will remove that exemption at some point in the near future, leaving the CHA with four teams and no autobid, and virtually ending any chance the league has to survive. As for its members, that's where things become hairy. Robert Morris hasn't been around very long, so it's tough to tell what their future will be. Niagara has enough of a history that they should be able to squeeze into another league at some point, though Atlantic Hockey - the most sensible destination - claims they are staying put at ten teams. Alabama-Huntsville faces an uphill battle to keep their program alive, given their location far away from everyone. Finally, Bemidji State is in a conundrum. The Beavers have tried to gain entry into the WCHA, but the league won't budge on its expansion moratorium. BSU has gone so far as to say their future as a program rests on entry into the WCHA. So far, that isn't happening. All these facts aside, it's time to mindlessly speculate. It's silly to count on expansion of Division I to help fill out leagues. We've heard about schools like Navy, Penn State, and Syracuse, among others, potentially having interest in Division I hockey. But those rumors need to go the way of Sid Hartman's Big Ten Conference theory (that is, away). I'll believe it when I see it, and for now, it's silly to count on this happening to help fill the ranks. We have to plan on making due with what we have. Robert Morris and Niagara are a package deal. One has to hope that the RMU program doesn't fold almost as quickly as it started up. That would be horrible for college hockey. That said, from a location standpoint, these two aren't an ideal marriage. But it makes no sense to break them up, especially when the price is the likelihood of a league having to awkwardly schedule around an odd number of teams. These two will find a home together, I hope. It makes geographic sense for Bemidji State to join the WCHA, but it won't happen by itself. Something else has to happen. Maybe UAH can jump into the CCHA while Nebraska-Omaha or someone else moves into the WCHA. The WCHA needs an even number of teams. No one wants to deal with an eleven-team league, which would create logistical nightmares for the schedule-makers and wreak havoc on the league's wonderfully-run postseason tournament (a huge money-maker for the league). Knowing only what we know now, I'll guess that Bemidji won't be joining the WCHA alone, if it ever happens at all. All four programs are in some sort of trouble. I'm especially worried about Huntsville and Bemidji. I think something can happen for Robert Morris and Niagara out east, but Huntsville is on an island, and Bemidji is stuck in a spot where the only league that makes sense for them doesn't want them. Some might remember a day where UAH and BSU battled it out for the now-defunct Division II title. Since no one outside of Minnesota-Crookston plays Division II hockey in the Midwest, it doesn't appear viable for Bemidji to drop back. They can't drop back to Division III for hockey because it would require them to stop giving scholarships in their Division II sports (some of which are quite successful). We can talk all we want about what the WCHA should do, or what the CCHA should do, but they both appear content with the teams they have right now. And it's not fair for these successful leagues to be criticized because they don't want to take on programs that might not be good competitive fits. In the end, I think the odds are approaching 50/50 that Bemidji State will have to either move back to Division II, accept that they won't get into any major postseason tournaments, and try to get back in the Division III NCHA, accept being a Division I independent and dealing with the difficulties of scheduling and the lack of any automatic NCAA Tournament consideration, or drop the sport altogether. With the history Bemidji State has with hockey, the latter should be considered a last resort, and it would be one sad day for college hockey if it ever happened. UAH faces a similar fate. They probably have to accept being an independent or drop hockey. It would not be a death-blow for the sport, but it certainly would seriously harm the chances of college hockey ever expanding to southern schools. Right now, Atlantic Hockey says they're not expanding. However, I don't think that's the final word. Before it's over, I see the AHA at 12 teams. Either that, or they'll split up into two leagues of six, allowing the sport to maintain their six automatic NCAA bids and a 16-team national tournament. That's the ideal situation. In the end, it's possible that Wayne State's decision is the start of a bad chain of events for college hockey. For now, it has to be said that this fate is preventable, but it's going to take a team effort. Oh, yeah. Hockey. It's almost hockey season. How do I know? Because we've had about a month of football. Let's crank up the baseball playoffs, more football, and hockey. Anyway, the annual Grand Forks Herald WCHA coaches poll came out Tuesday. The good ol' jinx didn't work last year, as the preseason poll picked Minnesota and Wisconsin to share the league title. Well, it worked, but only for half of the pick. Wisconsin finished in the bottom half of the league table, and they needed a first-round upset of Denver to advance to the Final Five. I've been quiet so far on the pucks. The league has again been hurt by offseason departures, but there is one team that was able to retain more top players than they lost, and that's the team the coaches have tabbed as a preseason favorite. North Dakota lost Jonathan Toews and Brian Lee to the NHL, but they return a wealth of talent, and coach Dave Hakstol has supplemented it with another strong recruiting class, including Derrick Lapointe, who won't need long before he becomes a top defenseman. Frankly, the middle of the league is a jumbled mess. There isn't much to separate Minnesota, CC, Denver, Wisconsin, St. Cloud State, and probably Michigan Tech. Tech is a definite threat if they can find some scoring. Then again, the same could be said for Wisconsin and UMD. I'm surprised by how easily Anchorage finished last in the poll. I think that program is a couple years away from being a legitimate threat, but there is no question to me that Dave Shyiak is doing a good job. UMD needs to score goals, probably more than anyone else. They're going to play strong defense, they have talented goaltenders, and they have a bunch of kids who will go all-out and aren't afraid of anything. However, you're always making it hard on yourself when you're winning games 1-0 or 2-1. Unless some of the talented young forwards can get in a scoring rhythm, the Bulldogs are faced with a low margin for error on the other end of the ice. Of the teams in the bottom half of the coaches' poll, I think UMD and Michigan Tech have the best chance to surprise and finish in the top five. St. Cloud State and Minnesota State will struggle too much defensively. Both UMD and Tech will be good there, but both need to find goals. Whichever one does will probably move up the ladder. Of the teams in the top half, I think the Colorado teams are probably the strongest bets to fall a bit. They're both well-coached outfits, which will help, but Denver didn't play well down the stretch last year, and CC didn't exactly light the world on fire, either. Both have lost some key players, making it difficult to just assume they'll be safe for home ice. Hit me up in the comments or on e-mail with your thoughts. I'll do a better job of this in a couple weeks before the first faceoff that counts. And, yes, I am even willing to entertain arguments that UMD won't be in the top five. Reluctantly, but I'll accept them. NHL set to open. Picked up The Hockey News 2007-2008 yearbook, which has some quality stuff in it. THN gutlessly picked Anaheim to win the Cup again, but I'm not sure they'll do that. Teams that make the Cup Finals have a history of falling off the next year, even if only a little bit. Anaheim has to replace Teemu Selanne on their top line, and I'm not sure Todd Bertuzzi is the answer. Not only that, but it felt like we were in a parallel universe last year, one where guys like Scott Thornton, Brad May, Travis Moen, and George Parros were actually useful in the playoffs. That won't happen again, and Anaheim isn't so stacked with talent that they can't be beaten in a seven-game series. The Wild are going to be good, but their inability to add any real toughness to this roster will doom them in April. It's actually going to be a surprise if it doesn't doom them before that, but they're lucky in that Colorado is still kind of rebuilding, Vancouver is caught with a relatively average team and a great goaltender, Edmonton looks to stink, and there is no knowing what to expect from Calgary under Mike Keenan. The season opens Saturday in London, which is a pretty neat idea. Outside of the fact that the Kings' ownership group owns the O2 complex in London, I really don't know why they're doing this. But regular-season hockey at noon Saturday and Sunday? Sign me up. As for picks on the NHL, I don't have much to offer. But I'll take a shot. Dropped Out: Texas A&M (#9), Louisville (#21), Arkansas (#23). USC continues to impress, and LSU looked sharp. Moved up deserving teams like Oklahoma and Ohio State in the top ten. Oregon was down 31-21 to Stanford in the second quarter, and I'm not sure what to make of that. Florida almost lost to Ole Miss, and that's not good. Kentucky may just be really good. Wisconsin is overrated until they can put together 60 minutes of something that remotely resembles good football (nothing against Iowa, but it hasn't happened yet). South Florida-West Virginia is going to be a fun game. I'm not sold on Rutgers, so they are where they are by default, really. Penn State needs to find a quarterback. South Carolina didn't play very well, and now they're making a QB change. Alabama is too shaky to rank higher. So when is it okay to talk about the playoffs? It's been a while, so I need help with this. I know the stat - 76% of 3-0 teams go on to make the playoffs. But that's not good enough for me. I need a better answer. Is 4-0 the right time? 3-0? 5-0? 8-2? Should I wait until they actually qualify for the playoffs? I need help from a Patriots or Colts fan on this. No matter the answer, the Green Bay Packers are indeed 3-0. It's a beautiful thing, really. The Packers didn't give a virtuoso performance in Week One, but won anyway. They were much sharper in Week Two, but beat up on a Giants team that hadn't looked very good so far. The true test would be this third game, the third straight against a 2006 playoff team. The San Diego Chargers have some great personnel along their defensive front seven. They have one of the league's best players in RB LaDainian Tomlinson. They have an emerging star in QB Philip Rivers, who gets to throw to one of football's top tight ends, Antonio Gates. The Chargers, surely, would show that the Packers' 2-0 start was no fluke, or that it was. Well, it's no fluke. This Packers team has the chance to be very good. Frankly, it doesn't look like the rest of the NFC North is equipped to stop them. The Bears have a quarterback problem. The Lions have, well, a secondary problem. Just ask Kevin Curtis and Donovan McNabb. 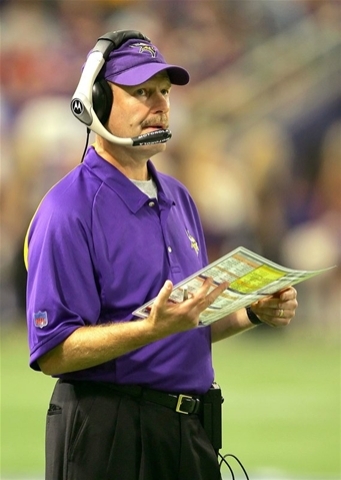 Brad Childress: Idiot. I tried to defend him to some of my friends who bleed purple after last year's offensive debacle. Even though Childress clearly had a bad year, I insisted that they give the guy another year to build up the personnel and install his system. How does he repay me? He hands the QB job to a clearly not-ready Tarvaris Jackson, ignores needs at wide receiver, does nothing to build up a shoddy secondary, and then shows that he is incapable of using Adrian Peterson properly. The Vikings led 10-0 at Kansas City before the Chiefs rattled off 13 straight points over a short span of like 40 minutes between the second and fourth quarters. Childress then proceeded to make two interesting decisions. First, he elected to punt with 2:18 left, even though the Vikings had the ball at their own 40 and only needed seven yards on fourth down. Then, after the Vikings made a quick defensive stop and got the "offense" the ball back at the 20, with 1:39 left, Childress left his best freaking player on the sideline for the entire final possession. Yes, Adrian Peterson, who had 150 of the Vikings' 252 total yards on this day, touched the football as much as I did when the game was on the line. Because Childress didn't want to expose the rookie in pass protection. Stop laughing. That was the reason he gave. An NFL head coach just admitted that he isn't creative enough to devise a way to use a potential star while masking a potential deficiency in his game. Thank goodness Childress was never Brett Favre's head coach. Probably would have benched him after one of those runs of interceptions that Favre has been prone to over the years, figuring that the guy was too mistake-prone and he couldn't afford to risk all those turnovers for the shot at a big play or two. I couldn't be happier that the Vikings hired him. He would have gotten Favre killed in Green Bay last year, because he never would have thought to keep fullbacks and tight ends in to block on obvious passing plays against blitzing teams. Luckily, Mike McCarthy can think outside of the box a little bit. More stupidity from baseball. This note is not related to bad or overzealous umpires, though we appear to have had two strikes from them in games Sunday. Padre Milton Bradley got into it with an umpire, and Brewer manager Ned Yost was so steamed after another tough loss in Atlanta that he called the umpiring a "joke". Both will be sanctioned, but neither were totally in the wrong. I'm not about to justify childish behavior, but it appears that Bradley was likely provoked by the umpire, while Yost was right to argue two heinously bad calls that went against his team during a late-inning Braves comeback. Not only were the calls so bad that they appeared to be intentional (you don't want to believe that a highly-paid baseball official could possibly be that incompetent), but one of the umpires could be seen smirking at Yost as he came out to argue. You may remember a urination contest baseball had with ESPN around the All-Star break over ESPN's decision to air All-Star Game selections before TBS' selection special was off the air, thus breaking something called an "embargo". Baseball kept ESPN from having any in-stadium broadcast access for the game, outside of their work with the Home Run Derby. No special "Baseball Tonight" set, and no special access for their people. Well, it appears that the two are feuding again. This time, it's over ESPN's decision not to run promotional announcements for playoff broadcasts on TBS and FOX. As FanHouse notes, ESPN isn't airing baseball playoff games this year, and they appear unwilling to promote competitors. Sports Business Journal notes that ESPN has a policy against running such promos for the competition unless they have a contract stating they must. The punishment could be similar to the All-Star deal. It looks like baseball is going to limit ESPN's access to the playoffs. Frankly, this is getting ridiculous. If there is no contract in place requiring them to do so, isn't this baseball's problem and not ESPN's? Why should the network feel compelled to promote the competition out of the goodness of their hearts? I can't imagine that this is a good thing for the long-term business relationship between ESPN and Major League Baseball. The embargo issue in July was one thing, because it could be fairly argued that ESPN was in the wrong. In this case, ESPN is absolutely not wrong, and baseball should be ashamed at themselves for bullying a good broadcast partner and promoter of the sport. After all, ESPN stuck with baseball through some pretty lean years. I hate to say things like this, because I'm not a fan of ESPN's baseball coverage these days, but go ESPN. I hope you win this battle. I'm so glad this Patriots thing is over. The only thing more annoying than the blowhards talking about how Belichick shouldn't get in the Hall of Fame or asking if the Patriots did this stuff in the Super Bowl (that's you, Mariotti) had to be the senseless idiocy of New England fans. Why is it that people compelled to defend someone in a story like this always feel the need to use the term "media-created" to describe the story. Sorry, Pats fans. Bill Belichick created this story. Did the media always handle it properly? No. But it wouldn't have been a discussion piece of any kind had Belichick not cheated. Also silly are those blaming Jets coach Eric Mangini. Fine. Shouldn't have snitched on his former boss. But how stupid was it of Belichick to pull that stunt against a coach that he knew was aware of the practice, three days after a league memo reminding teams not to do it? That's brazen, arrogant, and trumps anything Mangini did to break an "unwritten code". Anyway, I'm glad that we appear to be moving on. I wish I could be excited about more than one game this weekend, but the Chargers-Packers game is the only compelling one. Maybe Frisco-Pittsburgh or Indy-Houston, but the latter lost luster with word that Texans WR Andre Johnson would miss the game with a knee injury. Hopefully, this ends up like Week 2, which I wasn't terribly excited for but turned out very entertaining. San Diego at Green Bay: I'm trying not to get too giddy about this 2-0 start. The Packers have looked okay on defense, but were not sharp in that department for much of the Giants game. If they cover Antonio Gates like they covered Jeremy Shockey, they're screwed. Gates will have a field day if the Packers aren't physical with him at the line of scrimmage. While LaDainian Tomlinson is a concern, the Packers can neutralize him with a cornerback. The Chargers aren't deep at wide receiver, so coordinator Bob Sanders can be creative with his matchups to keep Tomlinson in check in the passing game. The Packers do have to tighten up against the run, but San Diego has yet to run well so far this year. For Green Bay, it's going to be all about copying as much of New England's blueprint as they can. The Packers need to take some shots deep to keep the defense from cramming the box, and they need to spread out the defense to neutralize (a bit) San Diego's dangerous linebackers. What will hurt Green Bay is the inept running game. What will hurt the Chargers is Norv Turner. What a weekend. Wisconsin tried to pull a Michigan. Notre Dame proved how horrifically horrible they are. I loved that UCF took Texas to the limit, and the riveting wins by Alabama and Kentucky made up for the other primetime game that sucked. Thanks for that, Callahan. I'm glad your team was prepared. Conference openers in the Big Ten this week. Possible upsets abound. And Duke tries for two in a row. Let's move on. Texas A&M at Miami (Thursday): This Miami program needs some time. I really believe Randy Shannon will turn things around, but it isn't happening tomorrow. Clearly, fans aren't into matchups with Florida International, but hopefully they'll show up and create some atmosphere for a big game. Miami's run defense looked awful at times against Oklahoma, and while A&M doesn't have OU's offensive balance, I think the Aggies have enough of a running game to keep Miami from taking control of the game. Oklahoma at Tulsa (Friday): Normally, a "mid-major" playing a team like OU may try to slow the game down with long drives and a lot of time of possession. That doesn't work here, as the Golden Hurricane will play offensive football at a frenetic pace. While Gus Malzahn's no-huddle spread attack will cause OU some matchup issues and negate their size advantage to an extent, the Sooners have too much talent on both sides of the ball. Illinois at Indiana: The Hoosiers are 3-0, which is a nice start on their quest for a 13th game. Illinois clearly has a great running attack, but the balance will be key through the conference season. The Illini should get off to a good start in Big Ten play, assuming Juice Williams and friends can avoid bad (or any) turnovers. Penn State at Michigan: I'm tempted to go with Michigan. Penn State doesn't run a spread, and they're going to have trouble scoring points with a spotty run game and a mediocre pocket passer with questionable mobility. However, Penn State's defense is going to create problems for either a hobbled Henne or an inexperienced Mallet at QB for Michigan. Not only that, but I still tend to think Michigan is lost if something goes wrong in the first half. Maybe that's my newfound lack of faith in Lloyd or something. Northwestern at Ohio State: By losing to Duke, Northwestern erased all the progress they made in that Nevada game. Now they have to find a way to look alive for a conference game in Columbus, where the Buckeyes appear to have found out how to win games. They absolutely annihilated Washington in the second half last week. Iowa at Wisconsin: The Hawkeyes were caught napping last week against Iowa State, in part because their defense struggled to get off the field. This team isn't set up to win games 31-28, so they have to lean on defensive stops and turnovers to win games. Wisconsin's defense isn't likely to be threatened by the Hawkeyes, so they'll score enough points to stay unbeaten. Purdue at Minnesota: Maybe the Gophers can find a first-half coaching staff to start games before putting Brewster's staff in at halftime. In two of three games so far, Minnesota has looked unprepared, especially on defense. I said last week that Florida Atlantic would need a perfect game to beat Minnesota, but I wasn't counting on the Gophers committing seven turnovers. Unless Brewster and Everett Withers can clean up this defense, it's going to be a long Big Ten season. Michigan State at Notre Dame: You know, someone should really do something about this ridiculous non-conference scheduling by Michigan State. It's bad enough that they played UAB and Bowling Green, but Notre Dame? Bah! South Carolina at LSU: I tend to think South Carolina is a bit overrated, because they haven't really played anyone yet (I'm not sold on Georgia). The Gamecocks run into a buzzsaw in Baton Rouge, where the Tigers are usually very tough, but could be practically unbeatable with how they're playing. I smell a blowout. Kentucky at Arkansas: The Hogs need to rebound from a heartbreaking loss at Alabama, where Houston Nutt outcoached himself late in the game and allowed Alabama a chance to come back and get the winning score. It was a stirring road comeback effort, however. Kentucky is coming off one of their biggest wins ever, but the defense they'll face at Arkansas is one that is better than Louisville's and is anxious to prove themselves after allowing all those points last week. Georgia at Alabama: I already mentioned that I'm not a huge Georgia fan. Alabama kind of won me over last week, though their defense became strikingly leaky in the second half. That'll be a problem eventually, but not so much this week. Washington at UCLA: Washington is a better team than many expected, but UCLA will be looking to rebound from that 44-6 stomping by Utah last week. I'm not sure Ty Willingham can do enough to get his team ready for this. Colorado State at Houston: Slim pickings. Sorry. CSU played well against two "BCS" teams, but came away 0-2. Houston has a nice spread offense, but I think Kyle Bell and the Rams will keep them at bay a bit. Houston wins at home, but it won't be easy. Let me start by giving the automatic disclaimer. I really like Donovan McNabb. I think the world of his football talents, and I think he's one of the better people in the NFL. He's classy, intelligent, well-spoken, and survived the Terrell Owens reign of terror in Philadelphia with his job intact. So what I am about to say has nothing to do with what I think of McNabb as a person or as a football player. What is this? It's an acknowledgment of something we already knew: No one is perfect, and no one is always right. What McNabb tells HBO's James Brown in an interview for Real Sports is wrong. "There's not that many African-American quarterbacks, so we have to do a little bit extra," McNabb tells HBO. "Because the percentage of us playing this position, which people didn't want us to play ... is low, so we do a little extra." In just-completed Week 2, five of the 32 teams (15.6 percent) had black starting quarterbacks. Later in the interview, Brown presses McNabb on criticism of his performance -- and if African-American QBs are graded more harshly. "I pass for 300 yards, our team wins by seven, [mimicking] 'Ah, he could've made this throw, they would have scored if he did this,' " McNabb tells HBO. "Doesn't every quarterback go through that?" Brown asks. "Not everybody," McNabb replies. Brown then asks if the media is tougher on him than on white quarterbacks such as Carson Palmer and Peyton Manning. "Let me start by saying I love those guys," McNabb tells HBO. "But they don't get criticized as much as we do. They don't." Allow me a chance to respond. First off, McNabb brings up a point that is absolutely worth discussing. In fact, it's as much worthy of discussion now as it was when Rush Limbaugh said what he said on ESPN back in 2003. In a way, that's pretty sad. We're no more comfortable talking about issues of race now than we were FOUR FREAKING YEARS AGO. What isn't McNabb saying? He's not saying that he gets treated like crap because he's black. Similarly, Limbaugh wasn't saying that white quarterbacks get treated like crap because they're white. He simply said that the media had a desire to see a black quarterback succeed, and that may have masked some of McNabb's flaws as a player. After all, Philadelphia was winning games. Broken down, Limbaugh's argument was simple. He didn't think it was fair for the media to give McNabb all the credit for his team winning when it was the defense doing the dirty work (one of the exact quotes from Limbaugh's commentary: "The defense carried this team."). Look back at those early 2000s Eagles. What is wrong with saying that McNabb didn't really carry that team? He didn't. The Eagles were average throwing the ball, pretty good running it, and really good on defense. McNabb missed six games in 2002, and the team barely missed a beat all season. Anyway, I'm not here to defend Rush Limbaugh. I don't have enough time or energy to accomplish that. We've basically taken some rather interesting and thought-provoking remarks that were directed at the media and turned them into an indictment of the man's character. Oh, and it was four years ago. That, too. What I'm wondering is why a guy who, in 2003, was mad at Limbaugh for "going to skin color", and said "I thought we were through with that whole ordeal", would find it necessary to "go to skin color" in 2007. If anything, it's a better climate now for black quarterbacks than it was in 2003. More than anything else, I take extreme issue with his insinuation that people don't want blacks to play the quarterback position. Personally, outside of Byron Leftwich in Jacksonville, I find it hard to locate a black quarterback who hasn't gotten a fair shake from his team in recent years. Michael Vick was basically given a free pass by many despite his inability to consistently throw the ball with accuracy. Not only that, but he flipped off his own home fans and somehow got away from the incident with his endorsements intact. McNabb has been great in Philadelphia, and outside of Philadelphia (a town that tries to run out all their star athletes, it seems), there has been nothing more than isolated criticisms of his game. Tarvaris Jackson was basically handed the starting job in Minnesota despite the fact that he appears neither mentally nor physically ready to be a starting NFL quarterback. 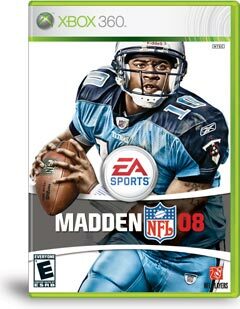 Vince Young hasn't even played a full season and is already on the cover of the world's most popular video game. Hard to argue that he's been mistreated in any way. Steve McNair is one of the most respected veteran quarterbacks in the league, and it could be argued that he got a bit of a pass considering how up-and-down he was last year despite his team's great record. The comments about Palmer and Manning are just silly. Manning just got done shaking a years-old label that he can't win the big one. It's a label that went all the way back to college. Palmer, meanwhile, has been outstanding. Dare I say he's been a better overall QB than McNabb, but his team hasn't accomplished a Super Bowl trip like McNabb did. Certainly, Palmer's not immune to criticism, but he hasn't exactly stunk at the position. I'm all in favor of this discussion, but I think McNabb would find, with some research into what he said, that he's not accurate in what he said. Around the league, black quarterbacks are treated more than fairly. Just ask Rex Grossman if he thinks skin color allows guys special treatment. Dropped Out: Nebraska (#8), Georgia Tech (#19), Washington (#20), Boise State (#21), UCLA (#25). I don't see any reason to tinker with the top six. Ohio State was clearly the most impressive of the rest, but I question their ability to score points. And yes, that sounds silly, considering they hung 33 in a road game this week. Nebraska, Georgia Tech, and Washington all stunk up the joint at home. Inexcusable, even against top opponents. Boise State should have been dropped last week. Sorry, I was in a hurry. Teams like Texas, South Florida, Virginia Tech, Clemson, and Rutgers rose by default, basically. Once you get past Ohio State and maybe Cal, there's a large gap. Wisconsin needs to stop sucking on defense. Now would be good. Can't even blame it on the new safeties, as the line and CB Allen Langford have done virtually nothing so far. Penn State would be a dangerous team if they had a trustworthy offensive backfield. They have basically everything else. Look out for Kentucky. That SEC East has Florida, who is really good, South Carolina, who is pretty good, and two overhyped big-name programs in Tennessee and Georgia. If Kentucky can take care of necessary business and pull an upset or two, they could find themselves in a New Year's Day bowl or maybe better. Speaking of "look out", Boston College could be dangerous.